There is nothing better then an epicurean scavenger hunt, and though I didn't intentionally set out on one recently, I found myself looking like a tourist in a Chinatown grocery. I mean, I was camera equipped and somewhat dangerous as I stopped in the middle of narrow, traffic-y pathways of the store. Fortunately, I didn't understand most of what was said in my direction, although I would have loved to be able to ask questions about some of what I was looking at. Fresh longans, rambutans, loquats, jujubees....butchered duck tongues, de-boned poultry feet, 1001 parts of a cow, 6 varieties of fresh crabs, I didn't know where to turn next. My partner in crime stood with hands in pockets most of the time, and I don't blame her. The unique ingredients and "fresh" handling attribute to an interesting smelling ambient. I would think twice about filling my lungs fully while at this market, but I was too involved in looking at giant okra. It was just about when I caught a giant pine cone at the corner of my eye. The only English label was "Flying Horse" and it was nested in a plastic net. Immediately I started taking pictures of this amazing thing, excited about the premise of coming back to buy one. I mean, who wouldn't want to eat a pine cone! Well, maybe just me. If you thought that's all the excitement I could handle, you were wrong. I saw something distinctly plastic looking in the produce section. As we got closer, this pile of black plastic, started to resemble bats. Yes, bats. No labels of course, but someone kindly explained, "Nut!". "Nut? ", I said puzzled. That's all the explanation I could have hoped for anyway. Getting back to the comfort of my home and wireless connection, I spent 20 minutes on google to try to find the giant pine cone and bat nuts. You'd think this is tough but google is far more knowledgeable then one expects. Bat nuts came up right away, with PG rated results. These are also known as caltrops and are apparently a flavor cross between a peanut and a water chestnut. 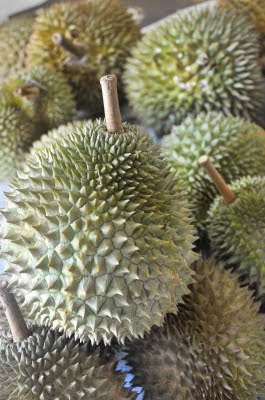 Giant pine cone was more difficult to find, but eventually, I did identify it as the Durian fruit, which I welcome you to read about...and even watch, so you can understand why I don't plan on rushing back to the market.